Email Deliverability Score is a value created by the Mail Tester service. 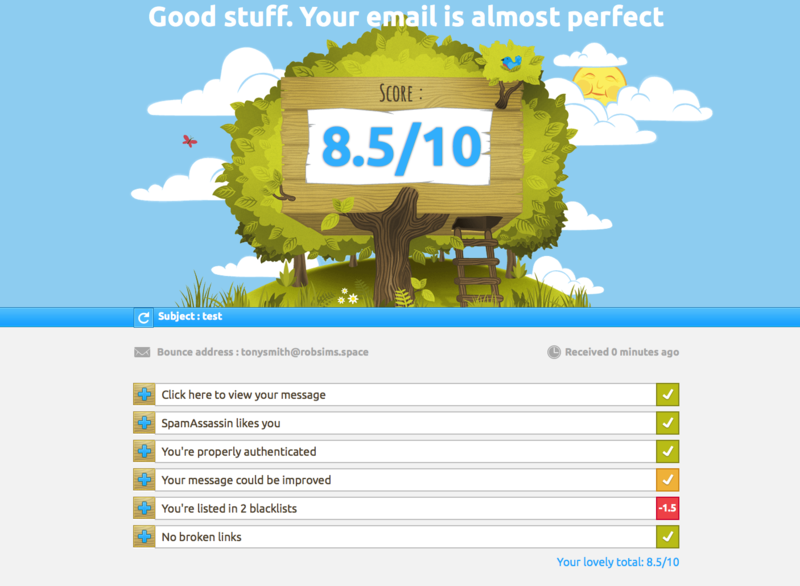 It is indicative of email account health; this score is crucial. The value ranges from 0 (bad) to 10 (excellent). The higher your score is, the less chance your have to get noticed by spam filters. You can check the Email Deliverability Score manually using the service or you can ask our Support team to help you. If you decide to check your Email Deliverability Score manually, go to the Mail Tester service and run their simple two-step procedure. When you get the result from Mail Tester, expand each section (+) to see the more detailed explanations. If you have issues with the performance of your email account, you might see warnings. Below is the list of the most critical warnings and our recommendations on how to deal with them. 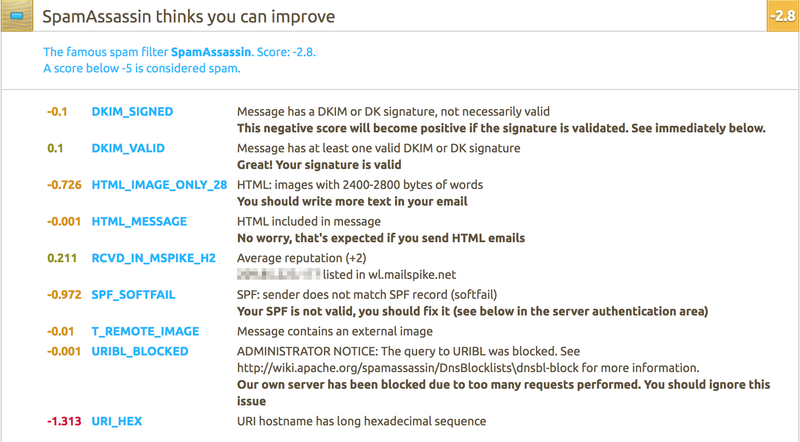 SpamAssassin is an anti-spam platform that includes a list of rules. Here is the example of the rule: URI_HEX warning. URI_HEX warning typically indicates that there is a URI (most likely an address or link) in your emails containing a long sequence of hexadecimal characters [a-f and 0-9]. This does not classify as an error and will not prevent emails from being sent; however, it is a warning to inform you that some spam programs may rank the message because it contains this URL. HTML warnings can be ignored since you’re sending emails from a third-party app (Reply.io). This section is the most important because it shows if your emails are properly authenticated. If your emails fail authentication, they can be marked as spam. Note: SPF, DKIM and DMARC are domain records, so to modify them you will need to have access to your domain settings (DNS) at your hosting website. The notification: “[SPF] yourdomain.com does not allow your server to use your email address” means that your domain is missing an SPF record or SPF record contains errors. SPF record is a TXT record in your DNS that identifies mail servers that are allowed to send emails on behalf of your domain. Your hosting website -> your account -> a DNS manager for a domain. Your SPF record should include a value from your mail provider (Google, Outlook etc.). There should be only one SPF record for domain. Multiple SPF records can cause deliverability issues. Thus, all the values should be added into one record. If you need to add multiple parameters in your SPF record, you might also want to validate your SPF record along with the sending IP addresses here before deployment. For Google hosted domains you need to open https://domains.google.com/registrar and find the DNS configuration settings there. Open it and scroll down to find the Custom Resource Records section. DomainKeys Identified Mail (DKIM) is a method for associating a domain name to an email message, thereby allowing a person, role, or organization to claim some responsibility for the message. To set DKIM you will need to reach out to your mail provider. After DKIM is enabled, you will be provided with a TXT record that you will need to set in your DNS records. G Suite users can authenticate their emails with DKIM using this guide. To set DKIM, it is necessary to generate encryption keys (private and public). The public key must be configured in DNS. The private key must be specified in the mailbox server for it to use the key for sending emails. Here you can generate an encryption key and get detailed instructions. Currently Reply doesn't provide users with custom DKIM, emails sent via Reply are signed with your own DKIM. You don't need to mention Reply's information in your DKIM record. A DMARC policy allows a sender to indicate that their emails are protected by SPF and/or DKIM, and give instruction if neither of those authentication methods passes. DMARC identifies the policy that shows the recipient’s side how to treat emails that failed authentication. If you are not sure, how to set DMARC or if you don’t have SPF\DKIM, you may leave DMARC un-configured to avoid issues with deliverability. DMARC should be configured in DNS. Before doing this, please make sure you have a DKIM and SPF set before configuring DMARC. We recommend to follow these instructions to generate a DMARC record, or use the recommendations by Mail Tester. Note: You don't need to mention Reply's information in your DMARC record. In most cases, you’ll see the same result unless you have a List-Unsubscribe header, which will make this section perfect. Mail Tester also runs a check to see whether your sending IP address is listed in the most common blacklists. If you find your IP address listed in one of those mentioned as Listed (red color) on the screenshot, you can ignore them. Sources like Hotmail, Yahoo, and Gmail are yellow sources. Yellow means that the IP address or host name contains no information about if it is good or bad and no reason to check white or black lists. In the case that you find your IP address in any other blacklists, it’s better to contact them directly and learn how to get yourself removed from them. Don't use URL shorteners as this will increase the possibility to get into Spam folders. Please let us know if you have warnings not mentioned here - we’ll assist you in handling them and add more info into this article! When you're done with the improvements, please let us know and we'll re-test your campaign.